Double Diamond is one of the simplest slots in land and online casinos and that’s probably the reason for its immense popularity. It’s a 3 reel, 1 payline classic Vegas casino slots machine with a special multiplier feature and a maximum jackpot of 1000x your bet size. Double Diamond slots machine was originally developed by IGT as a land based slot and only few years ago it was added to IGT online slots collection. 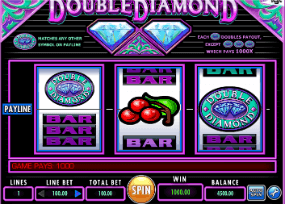 Due to its success, Double Diamond slot generated many sequels and reproductions, such as Triple Diamond and Triple Double Diamond. You can play free Triple Diamond slot here on our site. What stands behind the name of this slot is the Wild Diamond symbol, which not only substitutes for all other symbols, but also doubles your winnings. 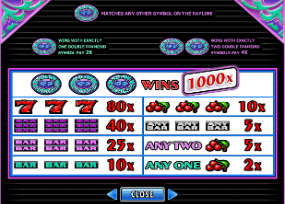 If you get 2 of them inline – your winnings will be multiplied by 4. If you are lucky to land three of them, you will win the maximum jackpot of Double Diamond slot, which is worth 1000x your bet. Besides the special wild, all the other symbols of the game are the classic 7s, Bars and Cherries. This is a great slot for those looking for classic Vegas casino experience. Without all the fuss and noise that many new video slots have. Just simple Spin and Win. The expected return of Double Diamond online slot is 95.44% which is far better than the average of 91% that you usually get in regular casinos.